This image, taken by OmegaCAM on the VLT Survey Telescope at Paranal Observatory, shows a section of the Ara OB1 stellar association. In the center of the image is the young, open cluster NGC 6193, and to the right is the emission nebula NGC 6188, illuminated by the ionizing radiation emitted by the brightest nearby stars. An extravaganza of stars, colorful clouds of gas and dust, and the emerging pillar of a cosmic nebula are all packed together in the same deep--space neighborhood that shines in an impressive new image from an observatory in Chile's high Atacama Desert. The bright heart beating at the center of this busy cosmic intersection is NGC 6193: a so-called open star cluster containing about 30 very young, very hot stars that haven't strayed far from their birthplace 4,000 light-years from Earth in the constellation Ara, or The Altar. The cluster is surrounded by huge clouds of gas and dust: a fertile soil for the formation of more new stars. Scientists with the European Southern Observatory used new observations with the Very Large Telescope to create a video tour of the star cluster NGC 6193. The larger collection of stars surrounding the NGC 6193 group is known as the Ara OB1 stellar association. A stellar association is a large, loosely bound group of stars that haven't quite drifted away from their birthplace. An "OB" association consists largely of very young blue-white stars, which are "about 100,000 times brighter than the sun and between 10 and 50 times more massive," according to ESO scientists. The Ara association is filled with gas and dust, which may collapse to form new stars. It contains a pocket of hydrogen (a primary ingredient in star formation) known as RCW 108, which is what's known an H II region. These regions form new stars but are also constantly disturbed by the wind and radiation emitted by other stars, as well as by supernova explosions. 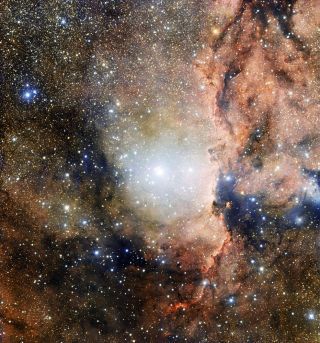 Only about 10 percent of the available material will end up contributing to star formation, according to ESO officials. The vertical wall of dark and bright clouds, to the right of NGC 6193, is the Rim Nebula, or NGC 6188. The nebula is showing early signs of "pillar formation," according to a statement from ESO. Perhaps the most famous example of nebula pillar formation is the Pillars of Creation in the Eagle Nebula (Messier 16), recently imaged with stunning resolution by the Hubble Space Telescope.